Our paper ‘The temporal dynamics and infectiousness of subpatent Plasmodium falciparum infections in relation to parasite density’  included malaria data from more than 15 countries and many research teams. Three words ring alarm bells to anyone doing malaria work in remote tropical settings: temporal, subpatent and infectiousness. These point towards the challenges of trying to keep track of the same people over time in longitudinal studies, generating high-quality molecular data to find low-level ‘subpatent’ malaria infections, and assessing infectivity to mosquitoes. Producing longitudinal epidemiological data is team sport. Co-author Dr. Leanne Robinson worked in Papua New Guinea where drivers, field nurses and communities were critical to successful outcomes. She says “Hidden behind every data point is the commitment of passionate staff spending countless hours navigating difficult terrain or walking long distances to reach communities beyond the end of the road. Cars regularly got stuck on the road to cohort participants but missing observations are detrimental to the study. 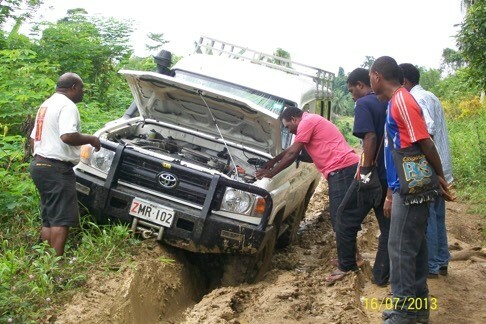 A car stuck in the field in Papua New Guinea. Photo: Dr. Leanne Robinson. 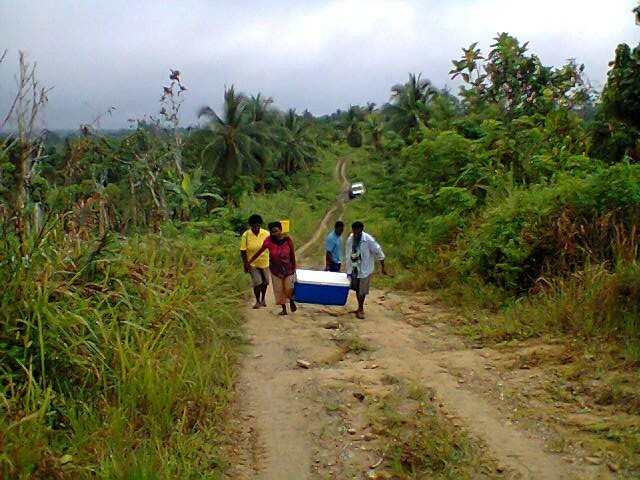 Continuing on foot to find cohort participants in Papua New Guinea. Photo: Dr Maria Ome-Kaius. The data from these large cohort studies becomes even more valuable when matched with mosquito-feeding experiments to assess how infectious these humans are. The work in Ethiopia provides great examples of the logistical hurdles involved in such studies. The first was to establish a local mosquito colony near a site where asymptomatic parasite carriage was common. This work started as a small grant for a PhD project of co-authors Dr Fitsum Tadesse and Dr Teun Bousema, his supervisor. Preliminary results uncovered many low-density infections in the field sites and stimulated the investigation of the infectiousness of asymptomatic P. falciparum and P. vivax malaria carriers. 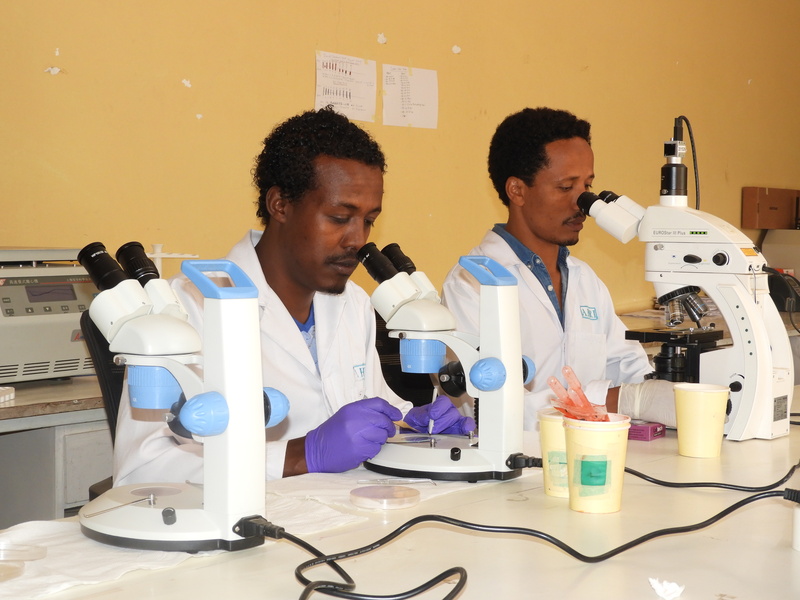 This component relied on a strong collaboration with Prof Delenasaw Yewhalaw (an entomologist at Jimma University), Wakweya Chali, and co-author Dr Endalamaw Gadisa from Armauer Hansen Research Institute (AHRI). 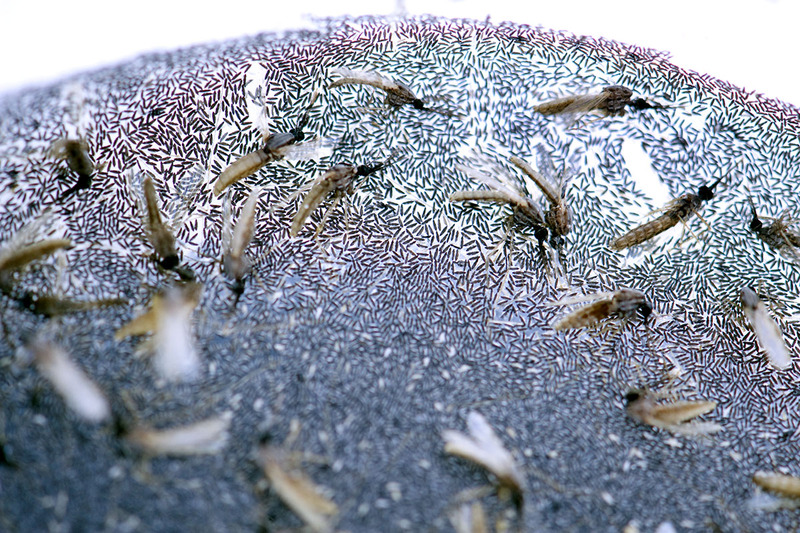 The production of mosquitoes that are free of malaria parasites and can be used for feeding experiments. Photo: Frank Muller, ZorginBeeld. When this real work started, unexpected trouble came. The country (Ethiopia) turned into turmoil from political unrest that resulted in frequent blockade of most of the major roads out of Addis. The day we decided to drive to Sekoru to bring the field work items was shortly after serious unrest in Bishoftu. We had to drive among burning vehicles and factories on our way out of Addis. The trip was unsuccessful and we had to return to safety and postpone the work until the situation calmed down. There was a feeling we might have to abandon the plans to perform mosquito feeding experiments altogether. During one of many Skype calls, Teun Bousema indicated to Fitsum Tadesse that ‘to any other person, I would suggest abandoning the plan and focussing on easier targets. But I guess with you, you will only see that as a stimulus to continue.’ The perseverance paid off in the end. The feeling of achievement was tremendous when we finally demonstrated considerable transmission potential from asymptomatic parasite carriers. This blog does not do justice to the complications in all of the study sites that contributed data. Sometimes it feels like a small miracle when data come together to reveal broader epidemiological patterns. Much credit goes to all of the hard work in the field, in the lab and behind computers. Prof Ingrid Felger, co-author said: “the interactions and synergies between molecular scientists and those with numerical skills (epidemiologists/statisticians) has been very rewarding and fruitful to better understand malaria molecular epidemiology. I am hoping for students with both skills, versed in bench work and data analysis, and of course, with his/her heart in the field work.” Truly interdisciplinary research, truly teamwork. Slater HC, Ross A, Felger I, Hofmann NE, Robinson L, Cook J, Goncalves B, Björkman A, Morris U, Msellem M, Ouedraogo AL, Koepfli C, Mueller I, Tadesse F, Gadisa E, Das S, Domingo G, Kapulu M, Midega J, Owusu-Agyei S, Nabet C, Doumbo O, Piarroux R, Koram K, Lucchi N, Udhayakumar V, Mosha J, Tiono A, Chandramohan D, Gosling R, Mwingira F, Sauerwein R, Riley E, White NJ, Nosten F, Imwong M, Bousema T, Drakeley C, Okell LC. The temporal dynamics and infectiousness of subpatent Plasmodium falciparum infections in relation to parasite density. Nature Communications 10;1433 (2019). Thank you so much for sharing this fascinating and inspirational story! It is rare to get such a first hand account of the challenges of field work - as you say, the memory of field work vanishes when the samples are being analysed. I hope you enjoyed writing the post and we would love you to write again.